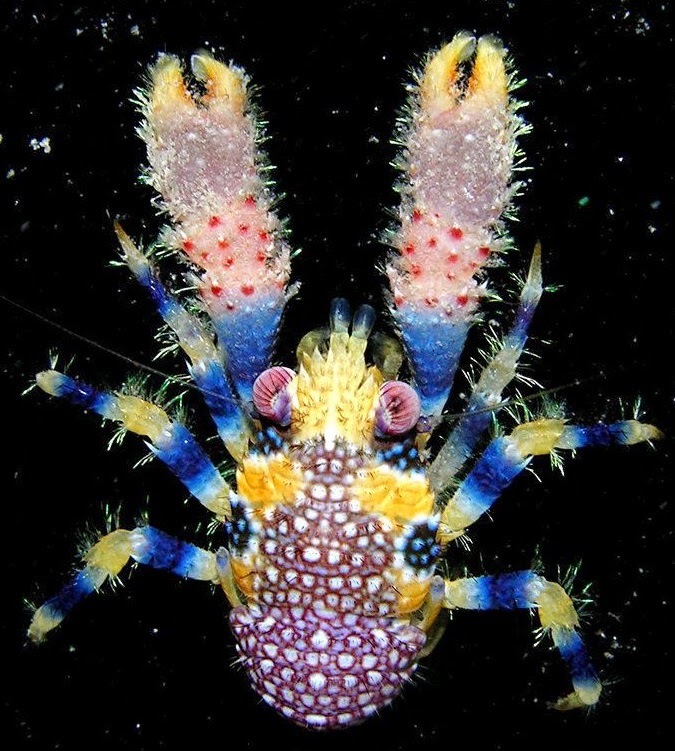 Would you ever imagine that there could be such a colorful lobster out there? 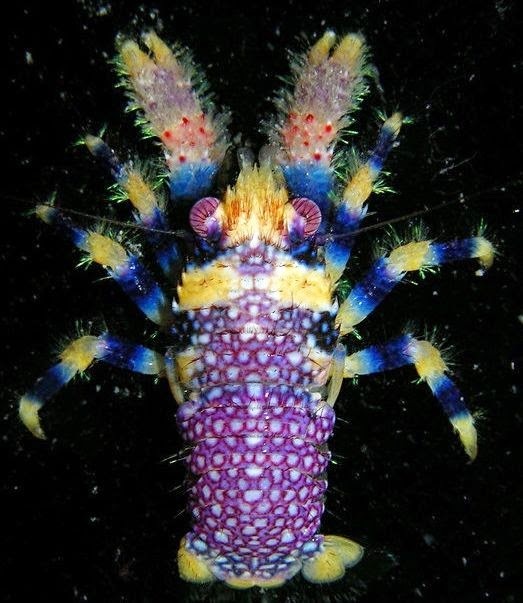 Meet Galathea pilosa, the world's most beautiful lobster! Galathea is one of the largest genera of squat lobsters, containing currently 70 recognized species; 17 in the Atlantic Ocean, 22 in the Indian Ocean and 43 in the Pacific Ocean. As for G. pilosa, it is a rare species that occurs exclusively in the shallow waters of French Polynesia. It lives among small pecies of coral or coral blocks, at depths ranging from 1 to 20 m.
Although first described more than 100 years ago in 1887, we still know very little about this amazing creature. It has a flat body and a tail that sits tucked underneath the thorax (the part of the body where the head fuses with the abdomen), a typical trait for Galathea lobsters. The carapace is quite small, only 0.8 to 1.2 cm long. The arms can be several times the body length. Undoubtedly, the complex patterns of bright blue, purple,yellow and red are the species' most distinctive trait. - All images property of the Moorea Biocode Project, shot in mid N coast, off Sheraton Hotel (Moorea, French Polynesia) and licensed under Creative Commons Attribution Non Commercial Share Alike 3.0 (CC BY-NC-SA 3.0).